There are really only two ways to update heritage homes: Use contemporary materials and products that keep to the spirit of the original design, or be totally anarchic by ignoring tradition and going with an aesthetic that suits your fancy. The worst approach is a pastiche of old style with a few jarring contemporary or wrong-period or poorly done, quaint items. 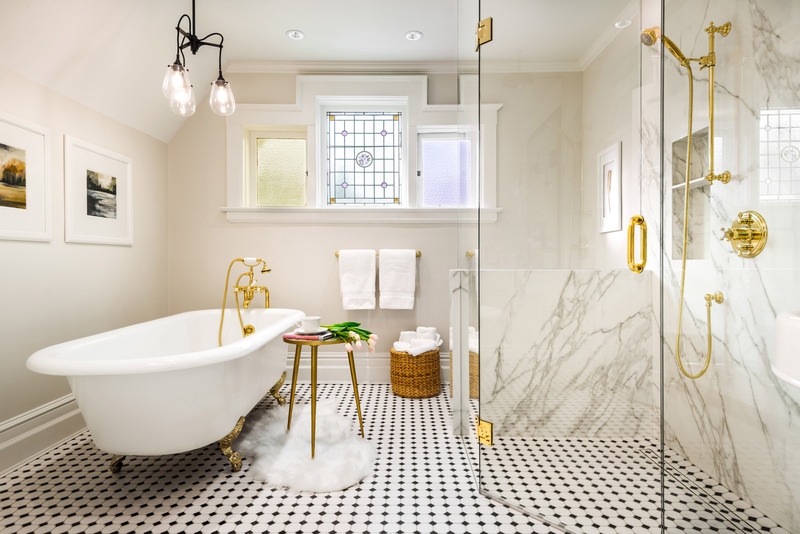 This bathroom in a heritage house in Victoria on the edge of Oak Bay is a fine example of the first approach. 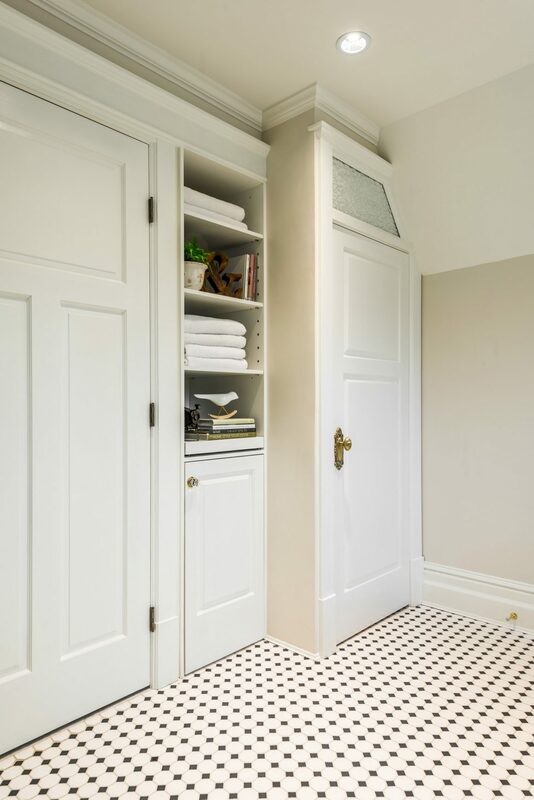 Indeed, interior designer Leanne McKeachie of Leanne McKeachie Design even used brand new floor tiles that almost exactly replicate the original hex-and-dot pattern. 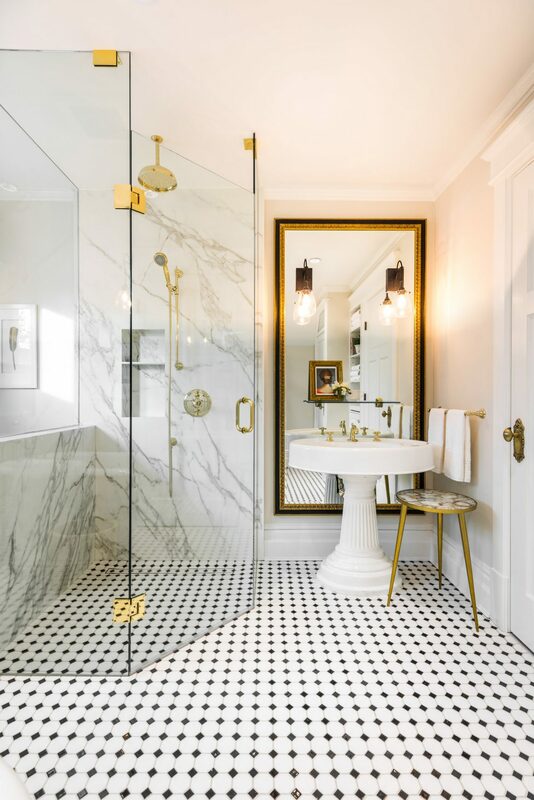 The 115-square-foot bathroom is part of a luxury rental apartment on the top floor of a two-storey house. The ground floor is commercial space, and the basement contains another rental apartment. “Originally, we were going to make this into a more functional bathroom by just adding a shower,” McKeachie says. 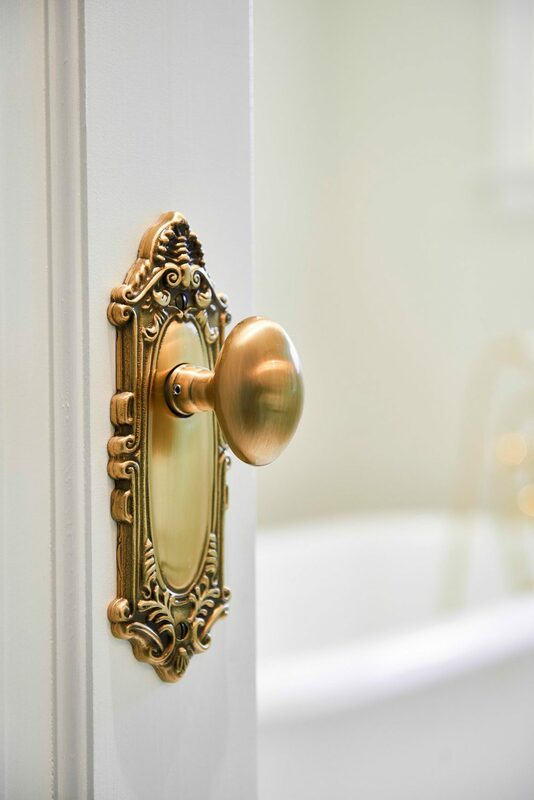 “But as happens with a lot of renovations, it blossomed.” The bathroom update turned into a complete gut job. “The owner said ‘If we’re going to do it, let’s do it right. Make it a showpiece,’ ” McKeachie recalls. “He wanted to be true to the original architect’s design intent. In fact, when years ago he had painted the house, he chose colours from a historical palette from that era to be sure the colours were on point. 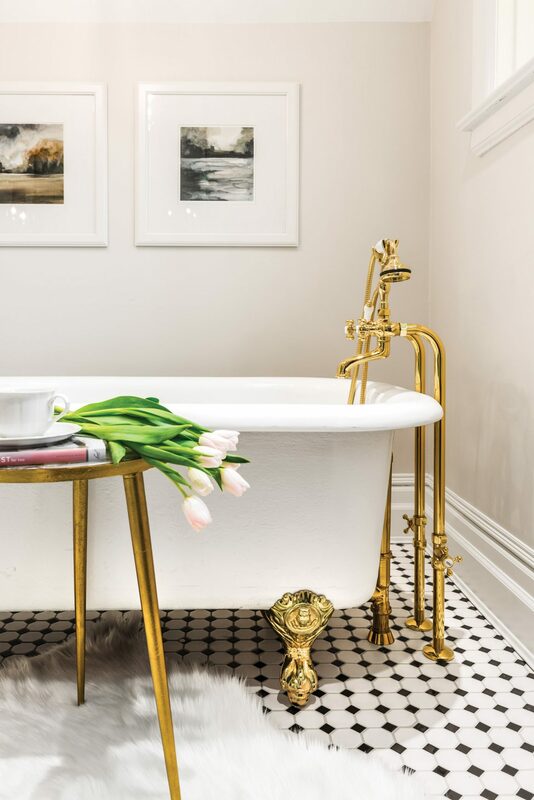 “Our biggest challenge was trying to figure out how to refurbish the cast iron tub,” she says. 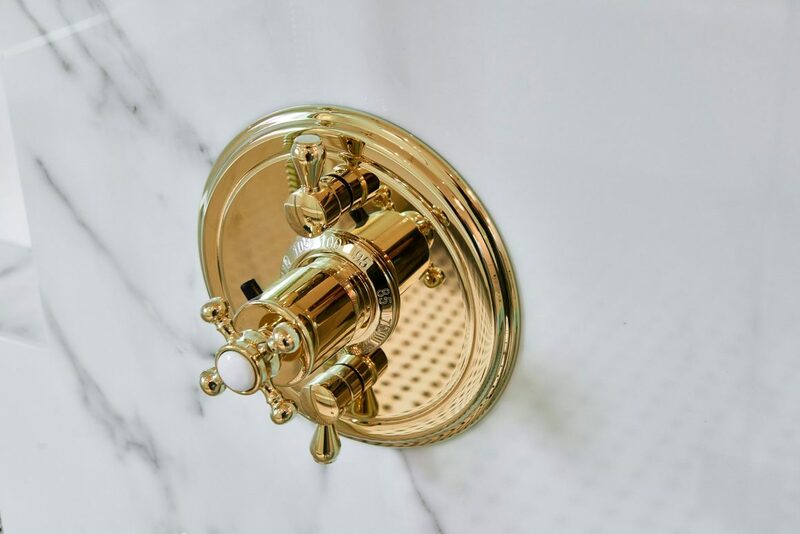 “It had lived a long life, being salvaged from the Empress Hotel years ago.” The contractor on the project searched diligently to find trades that could re-enamel the tub, replate the brass feet, and cover old holes and drill new ones for the plumbing fixtures. People were shorter a century ago, and the original pedestal sink was rather low. It too was refurbished, and then it was given an addition to the base to raise it. 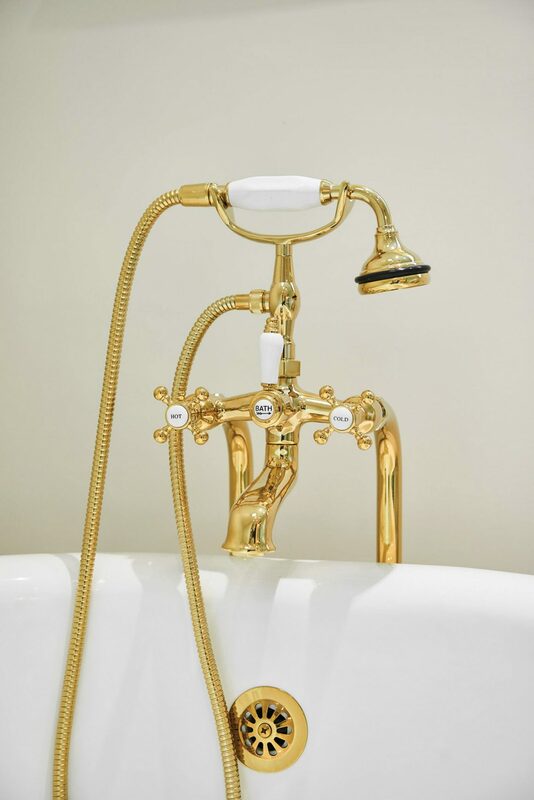 “These are beautiful antique pieces, part of the character of the house,” McKeachie says. One of the room’s very welcome features is a heated floor that extends into the curbless shower. 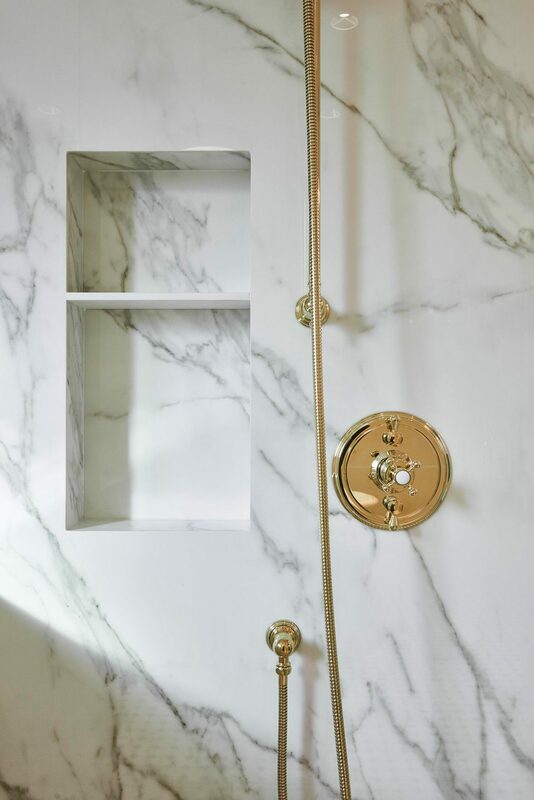 There was no shower in the bathroom’s original incarnation, and the enclosure itself is about as contemporary as you can get. However, being glass and frameless, it lets the shower recede in prominence and the room keep its sense of spaciousness.